Princess cut diamonds are square or rectangular cut diamonds that are beautiful additions to a wedding band, engagement ring, or other type of find jewelry such as a pendant. Some women prefer the look of a princess cut diamond, which was first invented in the 1960’s. This means that the diamond cut is relatively new when compared to other diamond cuts. Princess cut diamonds are a popular choice as an alternative to the round brilliant cut diamond. 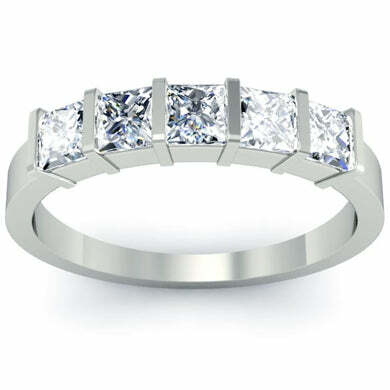 Below are available princess cut wedding bands available from deBebians. If you would like to create a custom wedding band or engagement ring that features princess cut diamonds, please request a free custom quote. 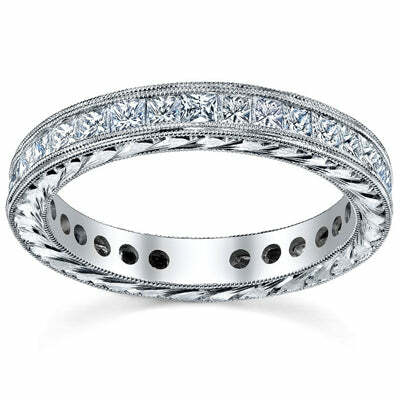 This is one of our most elaborate wedding bands that we offer. Not only is the ring channel set with G color VS clarity diamonds, the ring also features double milgrain detailing and hand engraving. This ring features diamonds the entire way around the ring. 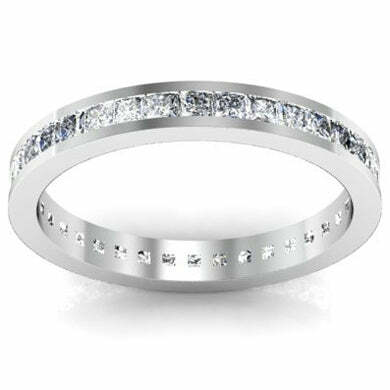 This 2.6mm band is set with 10 princess cut diamonds that weigh approximately 0.33 cttw. The diamonds have G-H color with SI clarity and are set into a channel setting. A channel setting is secure and modern while showcasing the beauty and sparkle of the diamonds. 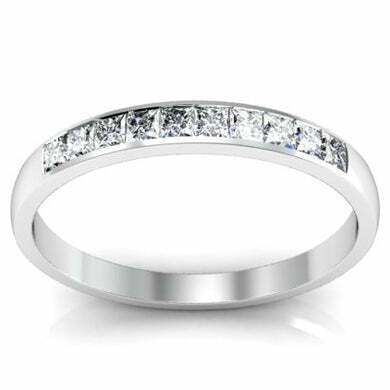 A five stone ring is a classic and timeless wedding band or anniversary gift. This particular ring is designed with a bar setting and features G-H color SI clarity diamonds weighing 1.00 cttw. The ring has a versatile width of 4.5mm and can be purchased in your choice of precious metal. A channel set eternity ring is elegant and can be worn alone, next to an engagement ring, or stacked next to other eternity bands. This ring has a total carat weight of 1.00 cttw. We use SI clarity G-H color diamonds and will manufacture the setting in the desired finger size and precious metal.